1 Week Long Tower Event And Ladder, Fair or Unfair?? Normally Time is need to unlock higher floors on Annex Tower so players are able to get the same amount of points or higher from Annex VS Solo Tower During Ladder. Couldn't Valiant Force Team have waited 3 Day After Event had started to Active Ladder, which would have allowed players some time to unlock the upper floors of Annex. The amount of Points and Energy needed to unlock floor 25 of Twilight Ascension within 1 week is 2 Times that of Questionable Loyalties which was a 2 week long event. Has Twilight Ascension been planned Fair to Players or is it Unfair? Re: 1 Week Long Tower Event And Ladder, Fair or Unfair?? Unlocking 25th floor is doable within 2 days. It's not hard plus we have awakened heroes now, no need to forfeit to debuff tower. 30th floor is even doable without awakened heroes at 0% debuff. And about the point, I think you have the wrong idea here, because the total point needed to get all reward is actually lower than Questionable Loyalty, because there are only 30 floors now. So far the event is good because event tower always give nice items. And with the change of event schedule I think we'll only have one week long event now. Personally I think it's better to start the ladder right away because the last 2 days after the ladder is used to clear solo tower. If the ladder starts 3 days after maintenance there will be no time to clear solo tower, and it's selfish to do solo tower before guild tower. It's possible to unlock Guild Tower 25th floor in 2 Days or less Depending on how strong the whole Guild is Vs Solo Tower where all floors can be unlocked under 1 Hour. Guild Tower isn't only about how powerful one's heroes are but Energy spent to gather points and unlock the next floor. Questionable Loyalty - 300,000 points was needed to unlock floor 25 and was a 2 Week Event. 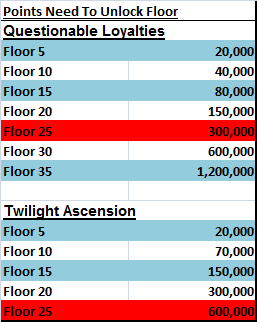 Twilight Ascension - 600,000 points are needed to unlock floor 25 and is a 1 Week Event. If this was a solo event and Ladder started right away it won't make that much of a difference but as it also a guild event there is a big difference in earning points for ladder on floor 20 of solo tower vs working on unlocking floors of guild tower till you make it to floor 20 and above. Overall I think this Event could have been planned better instead of following the same formula of a Solo Event or even keeping the points required to unlock floor 25 at 300,000 which could be reached within 1 Day depending on how strong the Guild is. I think you're looking at this the wrong way King - you're looking at 2 tower floors, both level 25, but they have different requirements to reach them. But the old tower was 40 floors, the new one is 30 floors, we should be looking at the "equivalent tower level" that require the same amount of points to unlock instead. Reaching floor 40 in the old tower is equivalent to reaching floor 30 in the new tower. Reaching floor 30 in the old tower is equivalent to reaching floor 25 in the new tower - both of which require 600k points. Reaching floor 25 in the old tower is equivalent to reaching floor 20 in the new tower - both of which require 300k points. Reaching floor 20 in the old tower is equivalent to reaching floor 15 in the new tower - both of which require 150k points. Reaching floor 15 in the old tower is equivalent to reaching floor 10 in the new tower - requiring 80k and 70k points respectively. If I have to make a guess, some of the lower floors probably got removed, maybe the old 1-5, along with the old 31-35 - as the old floors 36-40 is the same fights as the current 26-30 based on what I'm seeing in the tower right now. What I'm trying to say is that if your guild is at floor X now, you would be at the equivalent of X+5 if you were playing in the old tower. Perhaps a direct comparison isn't applicable because the tribute points per energy spent is different in the 2 towers for every floor. For example the old floor 29 gave 778 points per 15 energy (to unlock 30 requiring 600k points), but the new floor 24 is giving 980 points per 15 energy (to unlock 25 requiring 600k points also). From this data, it looks much much faster to unlock the new tower's 600k points lvl 25, than it took to unlock the old tower's 600k points level 30. Yes, But after reviewing and comparing the points gained % doing the old and current tower event, i'm guessing Valiant Force Team have increased the points from floor 5 and above after receiving complains about it. Other wise the points gained would have been boosted from floor 1 of Apex Tower. The point gained from tower is never changed since day 1, I can testify since my guild unlocked 25th floor in day 1. And if we're comparing this tower with the old guild tower, doesn't that makes this tower fairer than the older? how frequently did you record the points gained from each floor after event had started? 2-3 times of buying energy daily, done by 25-30 members. We even made a spreadsheet to determine which floor yield the best point to unlock higher floors. I think at this point you just refuse to believe that 1-week tower event is fair. Why are you comparing 24F of each tower? TA Tower end at 30F - Does QL Tower end at 30F? If your guild is unable to unlock as fast as you'd like it to be, VF side should be liable for this weakness? 1. Guild A cleared 30F on 1st day. All members can saved up to 300EN again for the ladder. 2. Guild B cleared 30F on 2nd day. Not all members can saved up to 300EN for the ladder. 3. Guild C cleared 30F on 3rd day. No members can saved up to 300EN, because ladder start on the same day. Question: Will this be consider "fair or unfair"? It is unclear whether thread topic is related to the 3 concerns made on initial post. Anyway, let's hope future towers are plan properly.